Best of the week: news and reviews 20.04.13 | What Hi-Fi? This week on whathifi.com we've been reporting live from LG HQ in Seoul about the launch of its OLED TVs, as well as comments by the South Korean firm on any future release of Apple's long-rumoured TV. Yamaha's launch of its 2013 US Aventage AV receiver range is a taste of what's to come here in the UK, while Sharp's financial woes continue with rumours building that the firm is willing to sell its stake in Pioneer. Meanwhile Onkyo announced a new range of in-ear and over-ear headphones. New reviews arrived in the form of B&Ws long-awaited Z2, Panasonic's latest effort in the plasma market and another top-quality TV from Samsung. Read on for all the details. 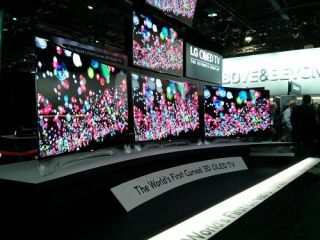 Surprising everyone this year with a curved OLED 3D TV at CES, the South Korean firm LG has cemented plans to release the TV in the near future with the "second half of 2013" reported as a launch window. LG also expects substantial numbers of OLED and 4K TVs to be sold over the next 24 months, despite a slow start with just 200 OLED models having been sold in South Korea so far. The electronics giant also conveyed that now "is not the right time for Apple to enter the TV market". A mere month after announcing the line-up of its first 2013 UK AV receivers, Yamaha has rolled out the first of its Aventage range with the RXV-A730 and the RXV-A830. Out in the US next month, UK availability and prices have yet to be announced. Sharp to sell its stake in Pioneer? Reports in the Japanese financial press have suggested that Sharp is looking to turn around its current financial woes by selling its 9.2% stake in Pioneer. It is thought that Sharp will put the proceeds towards alleviating the com[pany's debt. Previewed in Japan last year, more details emerged on Onkyo's latest headphone range at an event in London. Also announced at the event was Onkyo's alliance with Nashville-based instrument manufacturer Gibson Guitars. Held back after Apple's announcement of its new lightning dock last year, the long-awaited Z2 has made its way to our test rooms. Supplanting the Zeppelin Mini, it's what we've come to expect from B&W, terrific aesthetics married with great sound. We've long been fans of Panasonic's plasma TVs and with the company's recent announcement that it's stopped any further R&D on plasma panels, it looks as if the terrific PS55VT65B might be the last of the breed. With the UE55F8000 recently in our testing rooms, Samsung has set the bar high for TVs in 2013. Then second new model we've seen, the Samsung UE46F7000, more than matches it.